In many parts of the country, the most unwanted camper and motor home visitors are squirrels and rabbits. The can destroy the upholstery and chew the wires in the electrical system to shreds. Now you can stop them from getting comfortable in your traveling home with the RV ChewStopper Pack for Squirrels and Rabbits. This camper rodent repellent contains PredatorPee fox urine in liquid form with ScentTags to use outside around the vehicle to keep squirrels and rabbits away. We also have fox urine for squirrels and rabbits in unique PeeShots for use indoors anywhere you think they might get comfortable like under beds or in cabinets. Try this natural rodent repellent today! 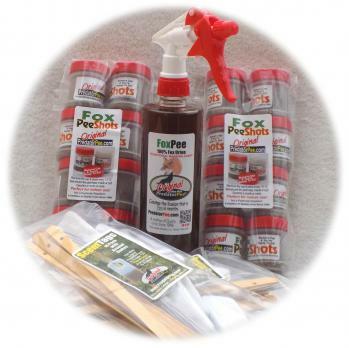 PredatorPee® Fox Pee Brand Fox Urine puts a pest animal’s natural predator/prey survival instincts to work to prevent damage to your yard, garden, home, barn, shed, garage, crops, plants, trees and shrub as well as cars, trucks, campers, RV’s and other vehicles and power equipment. Our PredatorPee® Fox Pee Brand Fox Urine introduces the scent of the predator to deter the following pests: rabbits, squirrels, skunks, hares, and chipmunks. When these pests smell the scent of a predator fox in the area, they want to be somewhere else and get there fast! So, if these are the pests you are dealing with, PredatorPee® Fox Pee Brand Fox Urine is the natural repellent you need. PredatorPee® - bringing Pee to the People for over 30 years!